According to new research published in the journal Chemical Senses, researchers have discovered a new sense of taste: oleogustus, otherwise known as the taste of fat. Fat embodies numerous characteristics that distinguish it from the other five taste sensations consisting of salty, sweet, sour, bitter, and umami. To further investigate, researchers evaluated various chain lengths of fatty acids to ensure that they, in fact, have different sensations distinct from other taste perceptions. Their first experiment evaluated differences between short-chain, medium-chain and long-chain non-esterified fatty acids and how they differ from sweet, sour, salty, bitter, and umami. The second experiment aimed to confirm the differences based on results from experiment one. All samples provided ensured that the texture and thickness of the liquid was similar so that experimenters could truly perceive and distinguish whether there is a “fatty” sense of taste. Characteristics of short-chain fatty acids appeared to overlap with taste perceptions of sour, while there seemed to also be some overlap between medium-chained fatty acids with umami. 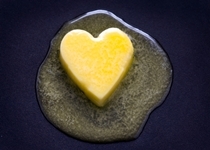 Experimenters were able to identify a distinguishable quality that differentiated long-chain fatty acids to other senses of taste. Further studies could investigate at what chain-length a fatty acid can elicit the “fatty” taste sensation. Researchers have coined this new taste perception as “oleogustus.” “Oleo” refers to an oily or fatty characteristic, whereas, “gustus” means taste.